From left: Joseph Champ, Jomaury Champ, and Asia Gaines. Jomaury’s family has filed a civil suit against the Chicago Board of Education for its role in an alleged beating orchestrated by his 4th grade teacher. 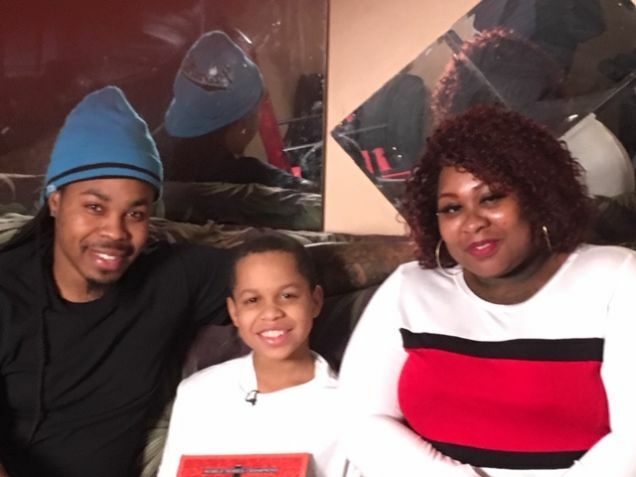 The family of a 9-year-old Chicago boy has filed a civil complaint against the city’s Board of Education for their role in an incident where the child’s teacher invited another woman into the school to beat him. According to Jomaury Champ’s family, his teacher, Kristen Haynes, arranged for a friend of hers to beat the child in a school bathroom using two belts the teacher kept in her classroom closet. The complaint was filed in a federal court Thursday morning. The alleged beating happened on Sept. 20, 2018, when Haynes allowed her friend, Jaunita Tyler, into George W. Tilton Elementary School to discipline Jomaury. 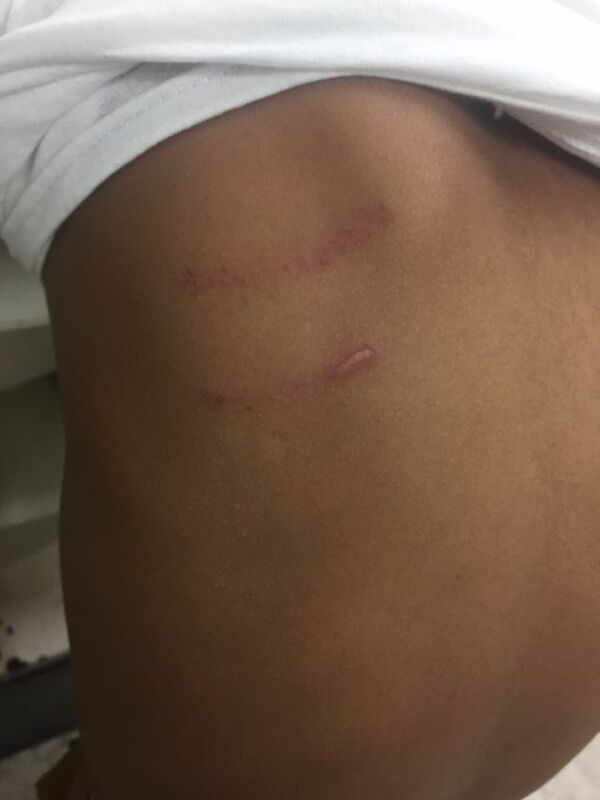 “Jomaury’s teacher then left the child alone–and unsupervised by [Chicago Public School] staff–and walked back to her classroom during the beating. His screams could be heard in her classroom, according to classmates,” the family’s attorney, Al Hofeld, Jr., writes. Tyler allegedly struck the 9-year-old with two large belts—provided by Haynes—about 20-30 times across his body, breaking the skin and leaving abrasions on the child’s body. Once he returned to class, “Jomaury sat at his desk and sobbed uncontrollably for hours,” Hofeld says. But Jomaury’s case is far from isolated. Chicago Public Schools have been pressed before about disturbing claims that its teachers and staff members have physically abused students. Over the years, CPS has been opaque about how many such incidents of corporal punishment have been investigated—and how many teachers and staff members have been disciplined as a result. Hofeld told The Root that his office sent Freedom of Information Act (FOIA) requests to the Chicago Board of Education to release data on corporal punishment complaints—including any instances where disciplinary action was taken, or incidents where a corporal punishment complaint resulted in a termination. Hofeld says the board has declined releasing that data because those records are kept separately, and it would be too much administrative work to compile. What makes Jomaury’s case particularly bizarre is Tyler, the woman accused of beating him in the boy’s restroom, is a distant relative of his. But his parents say Tyler has been estranged from the family for years, and Jomaury never met Tyler prior to the day of the beating—nor did Tyler identify herself as his relative to the child. She’s not listed as a contact in any of his school records, Jomaury’s family says. Tyler confirmed to a Chicago CBS affiliate that she was at school the day of the beating, but denies touching the child, telling reporters that she simply talked to him about his behavior. “Auntie’s gonna pay you $5 a week if you be good in school,” she claims she told Jomaury. She said she had the conversation with him in the school’s bathroom because of a medical condition that causes her to urinate every 5 minutes. Tyler has a history of battery; the 56-year-old woman, who has worked as a foster parent, been charged with child endangerment previously, and charged with domestic battery five times. She was convicted once on domestic battery charges, in 2005. Jomaury’s parents didn’t know about Tyler’s confrontation with their son until later that day, after he came home from school and told them what happened. They also don’t know why Haynes singled out their son to be disciplined in the first place. The suit claims Jomaury had no notable history of discipline or disruption in school. “What’s striking to me about this case is the amount of trauma that Jomaury is now suffering as a result of his teacher’s cooperation and assistance in this beating,” Hofeld told The Root, noting that Jomaury was enrolled in a hospitalization program 5 days a week for about 2 months after the incident took place. While the family awaits a criminal trial against Haynes and Tyler slated for later this month (the pair are facing charges of child endangerment and battery), the civil complaint identifies the Board of Education as the defendant for its role in condoning and enabling Haynes’ behavior. Jomaury’s mother, Asia Gaines, says Haynes showed her the belts during a parent-teacher meeting weeks before the alleged beating. According to her, the two belts—one black, one brown—were conspicuously displayed in a classroom closet. Haynes explicitly told her she made the belts available to parents who wanted to come into the school and discipline their kids. According to Hofeld, Tilton Principal Sylvia Yvette Hodge was aware of the belts and condoned Haynes’ use of them. Since September, Haynes has been reassigned, pending a CPS investigation into the event. However, it’s unclear what the investigation found—or if it’s even been completed. Jomaury continues to attend Tilton because CPS refuses to pay for transportation to a new school, and his parents can’t afford to pay out of pocket for the transportation costs themselves, Hofeld says. He’s been bullied at school since the incident, with a lack of support from his teachers and administrators. He’s also been diagnosed with Post Traumatic Stress Syndrome following the incident, and takes multiple medications for anxiety and insomnia, as well as weekly psychotherapy sessions. Hofeld says the child regularly suffers from panic attacks, insomnia, and night terrors—and he fears the trauma could very well be long-lasting. In his eyes, CPS has failed Jomaury—breaching the trust between him, his family, and the school system.